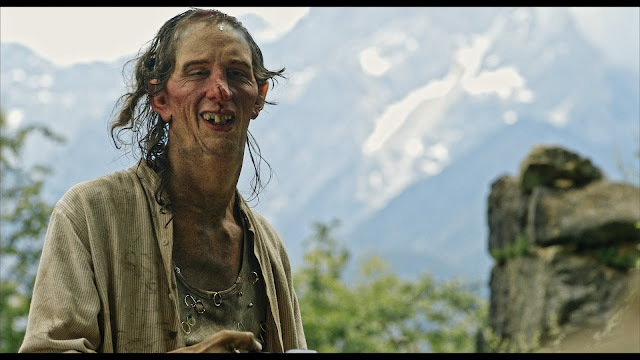 Killbillies, or Idila as it is known in it's native country is apparently Slovenia's first ever horror film. As you can probably guess from the wonderfully descriptive title this is a horror film about murderous hillbillies. In many ways this draws parallels with Deliverance, The Texas Chainsaw Massacre and The Hills Have Eyes but set against the stunning backdrop of some Slovenian mountains. I really enjoyed Killbillies, sure it is not the most original of films but what it does is still very well done. It was impossible to ignore the films that have come before and must have influenced this but with the unique setting and fresh modern feeling it felt different enough to stand on it's own in the killer redneck genre. I was not prepared for how good the make up and special effects would be for this movie. This was apparent as soon the two brothers appeared, both with abnormalities to their bodies, Francl (Lotos Sparovec) has a huge bulbous nose and a growth that has all but swallowed his right eye, while lanky Vintlr has a weird stretched out look to his features. The make up effects on both these two look realistic and the contrast between these ugly humans and the bright and sunny setting created some surreal moments that actually brought to mind the 1931 Universal Pictures version of Frankenstein. The special effects are sparsely done yet also brutal looking, limbs are severed, there is a decapitation and scenes of quick violence. There was also a long drawn out messed up torture scene that did not look comfortable for the poor actress and with it's editing brought out a hellish tone. There is plenty of blood spilled and some great deaths scenes, both ones that were satisfying to watch, as well as ones that came out of nowhere and caught me by surprise. The violence seems realistic in that the antagonists are just as human as the victims, there is no sense of them not feeling pain, or reacting accordingly. In general the camera work is not always too special, but it is uniformly solid, there were no shots that looked at all amateur and scenes are always framed in the best possible way. One that sticks to mind is a protracted shot in the basement of a house, two characters in the background act out their scene while a prone person lays dead centre in the foreground, pretty special looking. I did have a few problems with the editing at times, establishing shots I found to always be a few seconds too long for my liking. There are just a few characters to be found in Killbillies but despite the language barrier (this is in Slovanian with English subtitles) I found the acting to be universally entertaining. Even someone like Mia who is a talkative air head was given a great performance by Rozman and had layers shown to her that made me actually give a damn about her, unlike in American counterparts where the self absorbed and most likely one dimensional female character would be dispatched with joy in the hearts of the viewers. The killers themselves we never find much about, they work better this way and we do at least see that they are capable of normal emotions. While the plot is nothing really I had not seen before I do like the pacing of it. After a prologue that seems distant and unrelated to the main plot the movie and more specifically the horror seems to burst out of nowhere. A chase which makes up a good part of Killbillies felt natural in its execution though sometimes I felt specific locations were chosen for their look rather than adding anything at all to the film. A part set in the ruins of some sort of castle for example was quite pointless with nothing happening in it. I did love the contrast between the antagonists and their picturesque surroundings set against the heroes and the dark, dank city they come from. While I did not like the way the film ended in terms of plot in terms of look it was a classic, ending on a long shot that again pushed ugliness and beauty together. While being held back a bit due to similarities of films in the genre that have came before I found myself having quite a fun time with Killbillies, I was impressed by both the make up and special effects while despite the language barrier I found the acting of the main cast to be good, so well worth a watch. 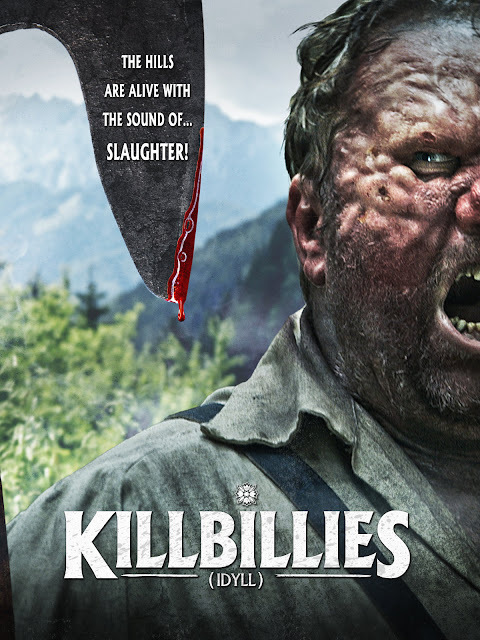 Killbillies is coming out on DVD and VOD on 25th October courtesy of Artsploitation Films. Check out the trailer below and see if it looks like your thing.